Volvo plans to drop S40, V50 in the U.S.
Poor sales are to blame for Volvo's decision to drop the S40, pictured, and the V50 sedan from the U.S. product line. 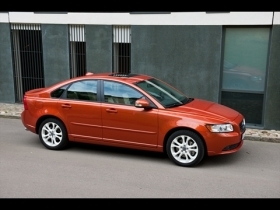 Volvo plans to discontinue selling the S40 sedan and the V50 wagon in the United States during the 2012 model year. The second-generation S40 came out in 2004, and the V50 debuted in 2005. According to Volvo spokesman Dan Johnston, S40 sales were down 29 percent by the end of last year and V50 sales were down more than 50 percent. "It seemed American buyers weren't looking for that kind of product," Johnston said, "and for us as a car company, it's not profitable to sell something that has a declining market share." Volvo will focus on cars that are selling at greater volumes, namely the S60, the XC60, the XC90, the S80 and the XC70. The XC70 is the automaker's only wagon left in the U.S. market, as Volvo discontinued the V70 this year.